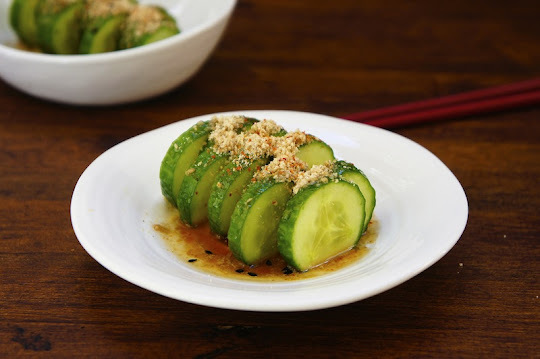 This is a light and refreshing Japanese inspired Cucumber With Sesame Dressing appetizer. 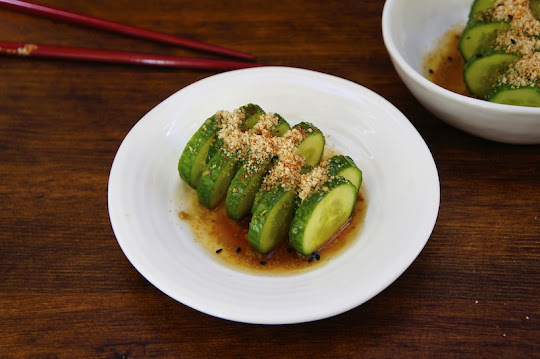 A quick cucumber pickle flavored with toasted sesame and soy sauce. Cut cucumber into ¼ inches slices and put into a mixing bowl, sprinkle with salt and mix well. Leave the cucumber for 10 minutes to absorb the salt then drain off excess liquid. Return cucumber to the bowl and mix with the sesame dressing. To serve, arrange the cucumber and spoon the sauce over it, and sprinkle with some pounded sesame seeds and spice mixture. I think I made something similar a while back, only without the yuzu vinegar. You can try preparing a poppy seed vinaigrette for almost every salad or sliced vegetables as well if you're into this kind of stuff. I tried it and it's delicious.